There is a very plain word which describes this revolutionary new system I’ve been putting into place in my life. “Routine”. I know – it’s not very exciting and it doesn’t really seem revolutionary at all. The word occurred to me this morning as I was exercising. I thought “this is what normal people do all the time”. I’ve always seen the word “routine” as a bad word – as bad as the word “normal”. But here I am waking up at the same time every day to do my morning ritual, then scheduling my office and meal hours. I started on March first and it’s been two weeks now. The only one part of the daily plan that I have yet to implement is the 10pm “Relax” time. So far I have continued working each night until I was too tired to go on any longer and then finally put myself to bed. I think I’ll get around to the relaxing part eventually. (maybe once taxes are done) Routine. There is something peaceful about it – and something maddening as well. Surely the schedule is helping me make sense of the otherwise shapeless hours which make up my daily life. 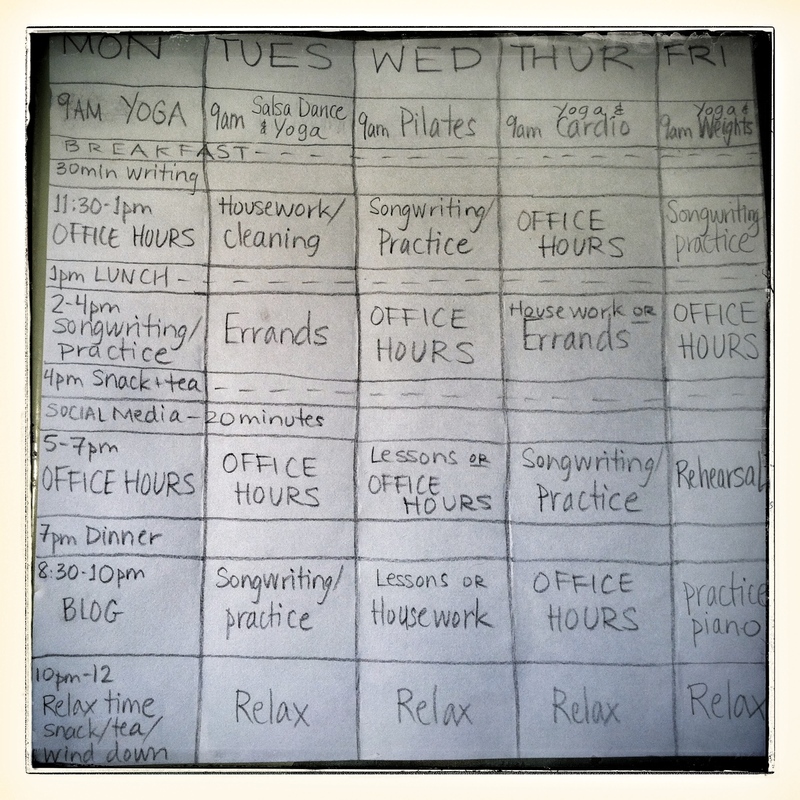 I’m feeling a little bit more in control – and I’ve been quite productive! Part of me wants to be constantly on the road where I have no control over the circumstances and timing, where the scenery changes each moment and there are new faces and names to learn each day. Part of me thrives in that environment. But there are other parts of me – parts that crave that elusive thing called “home”, parts that really want a routine, that enjoy having a little control. I am the constant balancing act of all these parts and my pendulum has been swinging in one direction for a very long time. Now I’m at the other extreme – the extreme called “normal” and (at least for now) I’m feeling quite at home.